The MiniSD Card is a relatively new addition to the Secure Digital media format. The MiniSD Card is a flash memory device that can hold digital information for a wide range of consumer electronic devices, but are usually used for mobile phones. 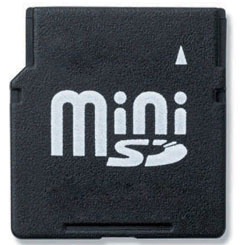 All MiniSD Cards come equipped with an adapter that will fit all standard SD memory card slots. This way you can use MiniSD Cards in mobile phones and your digital camera or Mp3 player. Currently, storage capacity for an MiniSD Card is in the range of 2 to 4 gigabytes. MiniSD Card have been made with storage capacities as low as 16 Megabytes, but they are most common in storage sizes from 512 MB to 2 GB. Expect the storage size to grow over the upcoming years. One of the great advantages of the MiniSD Card is that it is backward compatible with many electronic devices that use standard SD memory cards. SD memory cards are used for millions of products including digital cameras, MP3 players and PDA's (personal digital assistants). Using the adapter, the MiniSD Card can easily and quickly be inserted in any device that is compatible with SD memory cards. With an MiniSD Card Adapter, you can use the card for your mobile phone and swap it with your digital camera or other device.